Pope Francis will celebrate World Youth Day this week in one of the most religiously non-restrictive countries on the planet, according to a recent Pew Research study. It is a country also undergoing major religious shifts. Among the 25 most populous countries, only four have low government restrictions on religion, with Brazil having the lowest of all (see chart). Brazil has lower restrictions, in fact, than the United States, where restrictions have been rising. Religious freedom, however, is highly valued in Brazil. 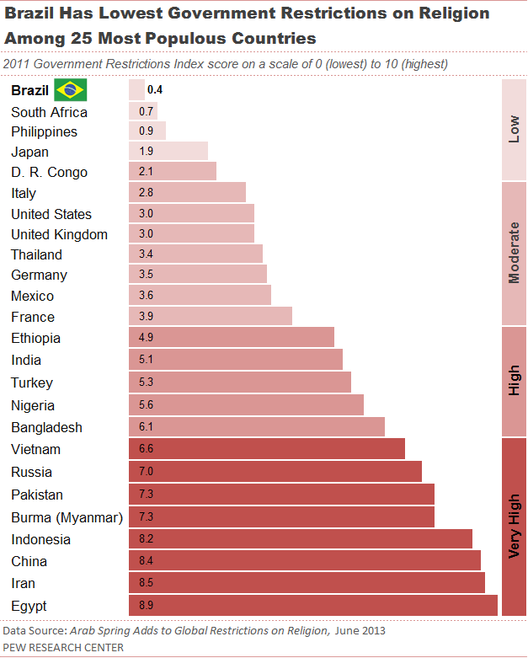 For instance, when Brazilians were asked in a 2006 Pew Research survey whether it was important to live in a country where there is freedom of religion for religions other than their own, nearly the same percentage of people indicated that this was important (95%) as indicated that it was important to live in a country where they can practice their own religion freely (96%). An expression of such support for religious freedom occurred this spring when the government of São Paulo - Brazil's commercial center and the western hemisphere's most populous city at 20 million - declared that henceforth May 25th will be "religious freedom day." This declaration coincided with a multi-faith religious freedom festival that drew nearly 30,000 participants, including the participation of the Catholic archdiocese, leading politicians and celebrities. Low religious restrictions and support for religious freedom are notable in a country that is undergoing what is perhaps one of the most dynamic religious shifts in the world today. Since the Portuguese colonized Brazil in the 16th century, it has been overwhelmingly Catholic. And today Brazil has more Roman Catholics than any other country in the world – an estimated 123 million. But a recent Pew Research analysis finds that the share of Brazil’s overall population that identifies as Catholic has been dropping steadily in recent decades, while the percentage of Brazilians who belong to Protestant churches has been rising. Indeed, much of the religious shift has been from Roman Catholicism to Pentecostal and Protestant denominations. For a historical overview of Pentecostalism in Brazil, see the Pew Research report Spirit and Power. Smaller but increasing shares of Brazilians also identify with other religions or with no religion at all. The Pew Research analysis notes that from 2000 to 2010, both the absolute number and the percentage of Catholics declined; Brazil’s Catholic population fell slightly from 125 million in 2000 to 123 million a decade later, dropping from 74% to 65% of the country’s total population. The number of Brazilian Protestants (including Pentecostals), on the other hand, continued to grow in the most recent decade, rising from 26 million (15%) in 2000 to 42 million (22%) in 2010. In addition, the number of Brazilians belonging to other religions – including Afro-Brazilian faiths such as Candomblé and Umbanda – has been climbing. In 2000, adherents of religions other than Catholicism and Protestantism numbered about 6 million (4% of Brazil’s population), and as of 2010, the group had grown to 10 million (5%). Finally, the number of Brazilians with no religious affiliation, including agnostics and atheists, numbered 12 million (7%) in 2000 and 15 million (8%) according to Brazil’s 2010 census. Given the level of religious switching in Brazil, it is particularly notable that a separate Pew Research study finds that there have been no reported incidents of hostility over conversions or proselytism. As the twentieth century progressed, however, laws were passed making proselytizing more difficult for new religious groups and, in the 1940s, the government stopped issuing visas for Protestant missionaries. These limits were short lived. After a period of military rule that ended in 1985, politically active Protestant denominations and minority religions worked to ensure that religious freedom became a defining characteristic of church-state relations. For more details, see The Price of Freedom Denied: Religious Persecution and Conflict in the 21st Century. Brazil is among the 76% of countries recently identified in a recent Pew Research study with initiatives to lower religious restrictions and hostilities. For instance, on January 15, 2012, President Dilma Rousseff approved an agreement to include the Holocaust, anti-Semitism, and other Jewish-related subjects, as well as racism, xenophobia, and intolerance, in the curricula of some schools, universities and other educational institutions.